There are lots of app available in android market to take backup of your android phone. 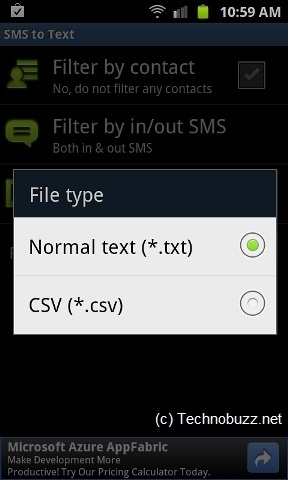 SMS to Text is a new android app which allows you to backup all your Android messages as a text file. Its a fastest and easiest way to backup messages as text file on your SD card. With the help of this freeware app you can filter messages by contact, filter by messages received or sent, sort by date or number and finally export it as a .txt file or csv file to your computer or to your android phone’s SD card. 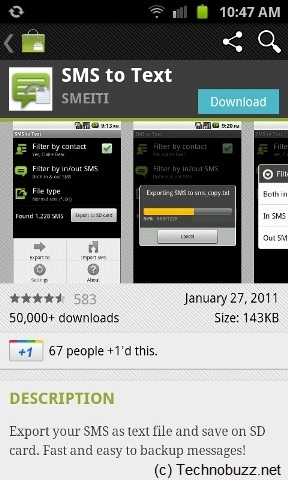 Go to Android market and install the SMS to Text app on your mobile phone. After the installation run the app on your android phone. Here you can see the option Filter by contact in/out SMS, Sort by date in/out SMS and File type in which you want to save. Now select the file type in which you want to backup all your messages. Select Text file or csv file as per your requirement. 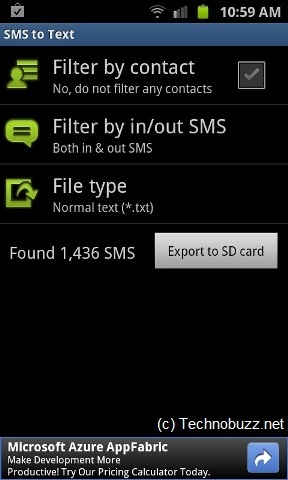 Thats it, now hit the “Export to SD” button to backup all your android text message on your Android phone SD card. You can follow us on Twitter or join our Facebook fanpage to keep yourself updated on all the latest from Android, Windows, Apple and Google. Hi, Thanks for the app review. With all the apps available on the android market I’ve never once thought to backup my phone. My question: are phones really all that susceptible they need regular backups? Does this app also allow to restore back up from text. file? Well I use an Android Phone and use 2 apps to restore my sms’es but will give this app a try to know how it works.